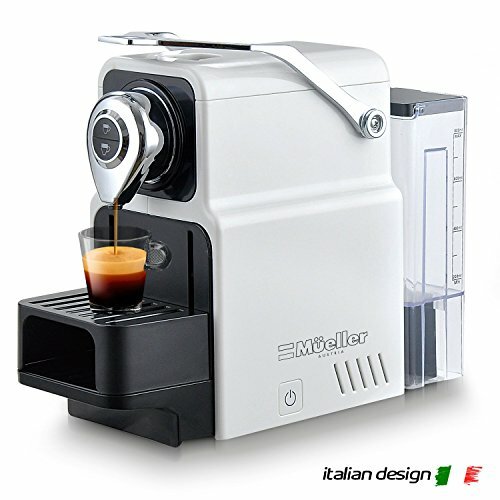 With the Mueller Espresso Machine you can make coffee at anytime without having to go out to get your favorite blends. With a tiny footprint, compact and lightweight, Mueller Espresso Machine is a smart coffee machine to make your life easier. One-touch operation and patented extraction system which delivers up to 20 bar pressure. Create a quick, delicious coffee. The water tank holds up to 24 oz. so you need not refilling. A fast-heat up time means the water reaches the ideal temperature in 60 seconds. An energy saving mode that automatically switches the machine off after 10 minutes. Note: 1. This coffee machine was special designed for the Nespresso capsules. 2. Mug and coffee capsules are not included in package. ☕ PREMIUM ITALIAN HIGH PRESSURE PUMP - Delivers up to 20 bar pressure which like premium professional machines allows for a barista-style result, unlocking the delicate flavor and premium aromas of each coffee capsule during the brewing process and creating an incomparably dense and unctuous crema. ☕ ULTRA FAST HEAT-UP SYSTEM - Mueller Espresso Machine only needs about 25 seconds to preheat, then you can get coffee immediately without preheating and within 10 minutes the energy-saving mode will switch off the machine automatically saving you electricity. ☕ EASY OPERATION - The one-touch buttons with two cup capacities Short and Long (Espresso and Lungo) can be reprogrammed to custom volumes and are backlit for ease of use. ☕ LARGE CAPACITY SMALL FOOTPRINT - With a small footprint taking up minimal counter space but a large water tank which is detachable, easy to clean and dishwasher safe, holds 27 fl oz/0.8 L water. ☕ EUROPEAN QUALITY - AMERICAN GUARANTEE - 100% 2 year warranty, 120V, 60Hz, 27 FL OZ/0.8L, 1400W, ETL approved product, Designed for use with Nespresso capsules. If you have any questions about this product by Mueller Austria, contact us by completing and submitting the form below. If you are looking for a specif part number, please include it with your message.